Pilates focuses on strengthening the 'Powerhouse' - the lower back, lower and upper abdominals, gluts and hips. From here we work on strengthening the extremities - arms, shoulders and legs. Exercises in Pilates incorporates stretch in all aspects of your body - the front, back and sides. Each Pilates exercise has an equal balance of stretch and strength to work toward more functional movements and better posture. The main apparatus is the Reformer which uses springs and your body weight to stretch and strengthen at the same time. Exercises are focused on Strength, Control, Conditioning, Co-ordination and Flow. 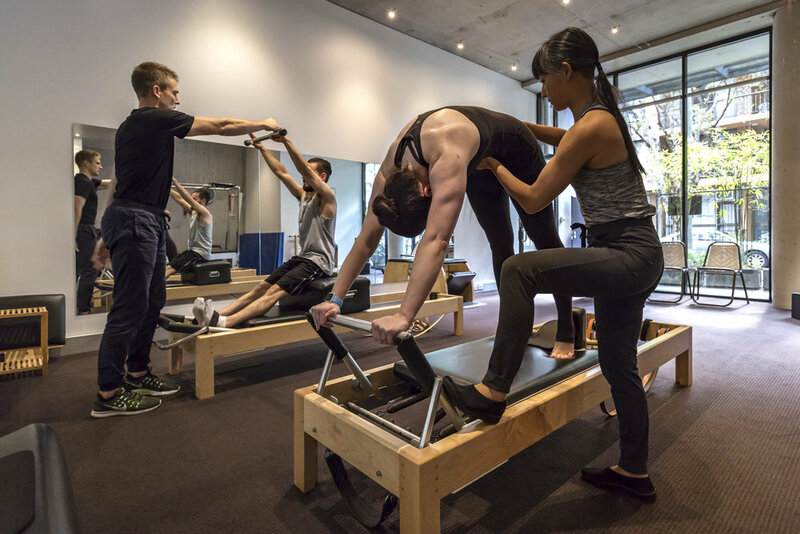 Reformer Pilates is a faster way to lengthen and strengthen your muscles without building bulk. Our emphasis is on delivering personal training and does not involve Pilates circuit training. This ensure clients grasp the technique and work exercises from the 'Powerhouse' opposed to their extremities - Proper technique leads to better and faster results in mind and body. As your level of strength and control progresses- so does your level of training. Flow is also a fundamental aspect of Pilates methodology for a more cardiovascular workout. Classes are individual and focused on fundamentals. Learn how to correctly engage using core principles of Pilates. In these private pilates classes, we will work on the reformer, mat floor work and other studio equipment for more specific individual needs. Classes are tailored and a segue into joining duet classes with a deeper understanding of the work. Private Pilates Classes are by appointment only or you can CLICK HERE to check availability and book online. **Studio Policy to Cancellations and Rescheduling - In order to best service all our clients, we have a 24 hour cancellation and rescheduling policy. Cancellations and rescheduling made within 24 hours are charged at full class rate.